350 ARTISTS – 15 DOWNTOWN LOCATIONS , RE-DISCOVER YOUR DOWNTOWN NORTH-CORE THROUGH CONTEMPORARY ART! Window Performances-See original “Wearable Art” creations by 15 incredible artists!, Dahab belly dancing-from Las Vegas! Music with 7 Live Bands & DJ’S, Drag Queen/King performances, Fierce and fantastic food by SWEET PEAS HOME CATERING & Restaurant, Delicious drinks, Unparalleled musical talents & much much more…You never know what you’ll see downtown! Performative Tour Guides will show you the way! – Start at Definitely Superior Art Gallery located at 250 Park Ave. & pick up your art map! 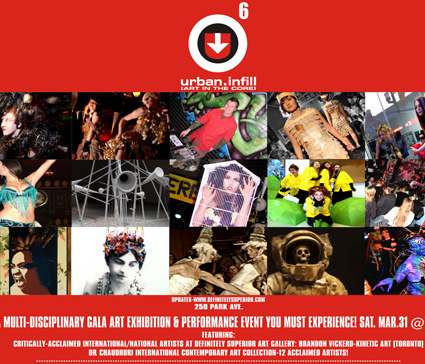 A MULTI-DISCIPLINARY GALA ART EXHIBITION & PERFORMANCE EVENT YOU MUST EXPERIENCE! SAT. MAR.31 @7PM Featuring: critically-acclaimed International/National artists at definitely superior art gallery: Brandon Vickerd-Kinetic Art and Sculptural Installation[Toronto] Dr. Chaudhuri International contemporary art collection-12 acclaimed artists!